Does your email inbox resemble a cluttered garage? One that hasn’t been cleaned up and organized in who knows how long? Boxes of clothing, household goods, books, and magazines ready to be dropped off, weeks ago? If your email inbox feels as overwhelming as that cluttered garage, it may be time to clean it up? Many tackle their garages at least once or twice a year. It takes a bit of time but is easy to do. Some items go back where they belong, while others are thrown out or recycled. The final product is an uncluttered and once again clean garage, providing the owner with a sense of accomplishment! Unfortunately, cleaning out that cluttered inbox often is not as simple. There are emails you must keep because they are part of the ongoing project. There are emails you need to respond to. There are those you need to keep for taxes, proof of purchase, etc. But all these emails add up. And before you know it, it feels like you’re drowning in your own inbox! That’s when you start “misplacing” messages. You can’t find some emails that were sent to you, and you end up asking for the information once more. Or perhaps, you feel so overwhelmed, that you start to ignore most of the emails in your inbox altogether. Whatever your response to a cluttered inbox, the sooner you deal with it, the better off you’ll be. 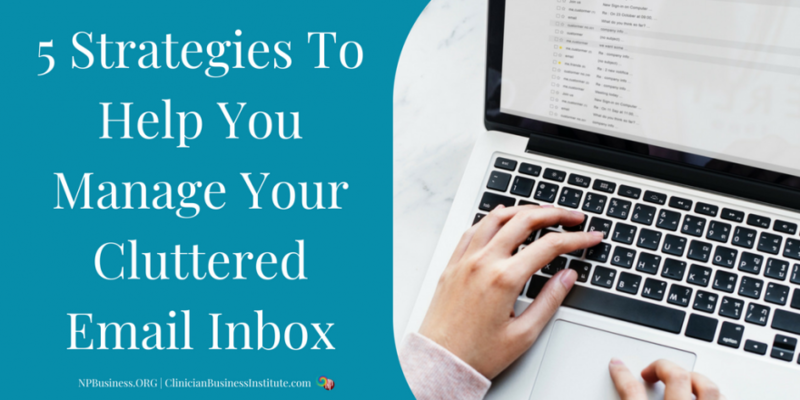 Below are five strategies to help you regain control of your inbox once again. #1 What’s your Comfort Level? Are you the person who can’t stand having hundreds of unopened emails sitting in your inbox? Or, is your threshold much higher? Decide what level and degree of organization in your email inbox you’d be happy with. Pick the maximum number of emails you ever want to see and then go to work and create that in your inbox. For some, it may take deleting every single last email, or perhaps deleting most all emails from their inbox. Others may be more comfortable archiving all or most of their emails. There is no right or wrong answer. The right answer is the one that you’re comfortable with, works for you, and helps you be more productive at work and in your personal life. There have been some interesting theories regarding individual email habits and personality traits. If you’re interested in learning more, I suggest you read this article. Chances are most of the emails you get are from people you want to hear from, or at least you did at some point. And then there’s the email you don’t care to receive, and you never open anyway. Unsubscribe and remove yourself from the lists you no longer want to be on. And don’t worry, if you change your mind and can always sign up for the list again. Next, search for those emails and delete them from your inbox. It will lighten your load, and you wouldn’t read the emails anyway. Unsubscribing from the lists you no longer have an interest in will remove a lot of clutter from your inbox. When you first get started with organizing and cleaning out your inbox, you may have to set aside a big chunk of time to get a head start. But once you have things under control, as much as possible, every day set aside time to deal with your email; don’t make a mistake and let it pile up again. And scheduling a slot doesn’t need to take a lot of time. Give yourself a start and finish time. Because if you do, you’ll find that you get much more efficient with cleaning out and managing your email inbox. You want to move from being reactive to being proactive. Because there’s no point of staying in reactive mode, where you’re continually putting out fires. When you are in reaction mode, you’re dancing to someone else’s drum, always responding to their requests, instead of paying attention to what’s on your own agenda. Use all the tools available to you to stay organized. Of course, this depends on the email client of your choice. For example, if you’re using Gmail, use the ability to filter incoming emails. Set up labels and folders to keep your emails organized and within quick reach. But, if you don’t do this, at minimum utilize the tag and search feature available with email clients to find the emails, you’re looking for. Spend some time thinking about what organizational structure works best for you. Next, go and set it up. If you need to keep emails but keep them organized, you’ll save yourself much time that otherwise would be spent hunting for that one email. When it comes to emails, most of us have developed habits. Some serve us well, while others don’t. How many times do you handle one email? Do you respond to important emails without delay? How long does it take you to deal with an email (on average)? Do you delete an email when no longer needed? Do you clean out your inbox daily, weekly, monthly? Never? Ask yourself what specific behaviors would result in a better email experience for you? What would it take to be more efficient and effective with your emails? Once you’ve identified these behaviors, install them in your daily routines. Monitor and tweak the behaviors as needed until you have found what works best for you. In summary, don’t let your email inbox get the best of you! Implement these five simple strategies and take back control. And then, keep up with your inbox and make that a habit. Are you struggling with your email inbox? Let us know what you have done to regain control.